We know you need specific features and details to make reporting and reconciliation easier and faster. With AffiniPay’s simple yet robust reporting, you can prepare reports for your board or for auditors with confidence and ease. Get all the transaction information you need in detailed, customizable deposit reports. Advanced search functionality lets you quickly and easily locate past transactions. Create custom reports for board meetings, audits, and other meetings with ease. With AffiniPay, you get the key functionality and transaction details you need to make reporting and reconciliation easier and faster. Generate transaction and deposit reports to view your payment data by a particular time frame or transaction status, member name or ID, or grouped by other custom tags you create. We deposit 100 percent of every transaction into your bank account, and debit fees all at once the following month. 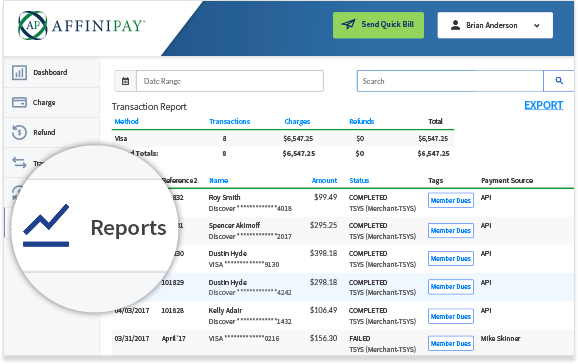 The amount deposited in your bank account will match what you see in your AffiniPay reporting dashboard, making reconciliation a breeze. We created our reporting specifically to provide you with all the details you need to make preparing for audits simple and efficient. Add extra fields to the payment process to collect specific information from payers. This allows you to tie additional information to a specific transaction.